It was an RSNA unlike any other. For the first time, radiologists and imaging stakeholders at McCormick Place witnessed an industry beginning to capitalize in earnest on concepts that — for so many years — seemed to merely describe lofty and unobtainable goals. Yes, artificial intelligence was everywhere you looked, but AI is just one part of the emerging radiology toolkit — a kit that is being reinvented right alongside the job description of radiologists themselves. There is an array of potential applications for 3-D printing in the health care industry, but investing in the necessary technology and materials has historically been costly enough to keep this technology reserved for academic facilities or on the fringes. Through partnerships with Stratasys and 3D systems, two global leaders in 3-D printing, Philips is poised to bring down some of those expenses. Using Philips' IntelliSpace Portal 10, providers can now create 3-D models of patient anatomy, thanks to these new partnerships. In the case of Stratasys, the models are generated in a Stratasys Direct Manufacturing facility and sent to the hospital within two days. 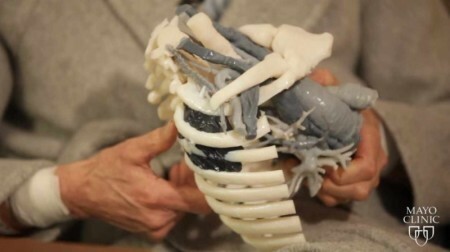 “It’s bringing 3-D printing to a lot of institutions that don’t have it on site,” Michael Gaisford, director of marketing for medical solutions at Stratasys, told HCB News at the meeting. Siemens also announced a 3-D printing partnership. Working alongside Materialise, the OEM is collaborating to allow hospitals to start in-house 3-D printing labs in a more cost-effective way. One barrier to adoption is that there’s no FDA reimbursement for 3-D printing. Materialise has partnered with RSNA as a member of the 3-D Printing Special Interest Group.